Clarification: Subject to completion of minimum six months continuous service and being in service as on 31st March, 2018. Point No.2: Employees appointed on purely temporary ad-hoc basis. Clarification: Yes, if there is no break in service. Point No.3: Employees who resigned, retired from service or expired before 31st March, 2018. Clarification: As a special case only those persons who superannuated or retired on invalidation on medical grounds or died before 31st′ March, 2018 but after completing at least six months regular service during the year will be eligible for the ad-hoc bonus on pro rata basis in terms of nearest number of months of service. Point No.4: Employees on deputation/foreign service terms to state governments, U.T.Governments, Public Sector Undertakings, etc., on 31st March, 2018. Clarification: Such employees are not eligible for the ad-hoc bonus to be paid by the lending departments. In such cases the liability to pay ad-hoc bonus lies with the borrowing organization depending upon the ad-hoc bonus/PLB/ex-gratiafincentive payment scheme, if any, in force in the borrowing organization. Point No.5: Employees who reverted during accounting year from deputation on foreign service with the organizations indicated in ‘C’ above. Clarification: The total amount of bonusiex-gratia received for the accounting year from foreign employer and the ad-hoc bonus, if any, due from a central government office for the period after reversion will be restricted to the amount due under ad-hoc bonus as per these orders. 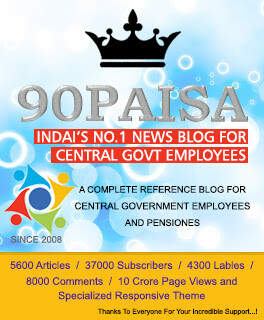 Point No.6: Employees from state Government/U.T. Admn./Public Sector Undertakings on reverse deputation with the Central Government. Clarification: Yes, they are eligible for ad-hoc bonus to be paid by the borrowing departments in terms of these orders provided no additional incentive as part of terms of deputation, other than Deputation Allowance, is paid and the lending authorities have no objection. Point No.7: Superannuated employees who were re-employed. Clarification: Re-employment being fresh employment eligibility period is to be worked out separately for re-employment period; the total amount admissible, if any. for prior to superannuation and that for re-employment period being restricted to the maximum admissible under ad-hoc bonus under these orders. Point No.8: Employees on half-Pay leave/E.O.L/Leave not due/study leave at any time during the accounting year. Clarification: Except in the case of leave without pay the period of leave of other kinds will be included for the purpose of working out eligibility period. The period of E.O.L./dies non will be excluded from eligibility period but will not count as break in service for the purpose of ad-hoc bonus. Clarification: Yes. if the employees are eligible for benefits like dearness allowance and interim relief. Categories not eligible for these benefits would be considered at par with casual labor in terms of ad-hoc bonus orders. Point No.10: Employees under suspension at any time during the accounting year. Clarification: Subsistence allowance given to an employee under suspension for a period in the accounting year cannot be treated as emoluments, Such an employee becomes eligible for the benefit of ad-hoc bonus if and when reinstated with benefit of emoluments for the period of suspension, and in other cases such period will be excluded for the purpose of eligibility as in the case of employees on leave without pay. Point No.11: Employees transferred from one Ministry./Department/Office covered by ad-hoc bonus orders to another within the Government of India or a Union Territory Government covered by ad-hoc bonus orders and vice versa. Clarification: Employees who are transferred from any of the Ministry/Department/Office covered by ad-hoc bonus orders to another such office without break in service will be eligible on the basis of combined period of service in the different organizations. Those who are nominated on the basis of a limited departmental or open competitive exam from one organization to a different organization will also be eligible for the ad-hoc bonus. The payment will be made only by the organization where he was employed as on 31st March,2018 and no adjustments with the previous employer will be necessary. Point No.12: Employees who are transferred from a Government Department/Organization covered by ad-hoc bonus orders to a Government Department/Organisation covered by productivity — Linked Bonus scheme or vice versa. Clarification: They may be paid what would have been paid on the basis of emoluments in ad-hoc bonus covered department for the entire year less the amount due as productivity-linked bonus. The amount so calculated may be paid by Department where he was working on 31s’ March, 2018 and/or at the time of payment. (a) Those who have put in specified number of days of work in different offices during each of the three years ending with the said accounting year. Clarification: The eligibility is to be worked out for three years from the said accounting year backwards. The period of 240 days of work in each of these years may be arrived at by combining the number of days worked in more than one offices of the government of India, for which bonus. ex-gratia or incentive payment has not been earned and received. (b) Casual labour who were not in work on 31st March, 2018 . Clarification: The condition of being in on 31st March, 2018 employment as laid down in these orders is applicable to regular Government Employees and not to casual labour. (c) Those who have put in at least specified number of days of work in each of two years preceding the accounting year but are short of this limit due to regularization in employment in the said accounting year. Clarification: If a casual labour, who has been regularized in the accounting year does not fulfill the minimum continuous service of six months as on 31st March, 2018 and therefore, cannot be granted benefit as a regular employee, he may be allowed the benefit as for a casual labour provided the period of regular service in the said year if added to the period of work as casual labour works out to at least specified number of days in that accounting year.